American civil religion is a sociological theory that a nonsectarian quasi-religious faith exists within the United States with sacred symbols drawn from national history. Scholars have portrayed it as a cohesive force, a common set of values that foster social and cultural integration. The very heavy emphasis on nondenominational religious themes is quite distinctively American and the theory is designed to explain this. The concept goes back to the 19th century, but in current form, the theory was developed by sociologist Robert Bellah in 1967 in his article, "Civil Religion in America." The topic soon became the major focus at religious sociology conferences and numerous articles and books were written on the subject. The debate reached its peak with the American Bicentennial celebration in 1976. There is a viewpoint that some Americans have come to see the document of the United States Constitution, along with the Declaration of Independence and the Bill of Rights as cornerstones of a type of civic or civil religion or political religion. According to Bellah, Americans embrace a common "civil religion" with certain fundamental beliefs, values, holidays, and rituals, parallel to, or independent of, their chosen religion. Presidents have often served in central roles in civil religion, and the nation provides quasi-religious honors to its martyrs—such as Abraham Lincoln and the soldiers killed in the American Civil War. Historians have noted presidential level use of civil religion rhetoric in profoundly moving episodes such as World War II, the Civil Rights Movement, and the September 11th attacks. An important dimension is the role of the soldiers, ready to sacrifice their lives to preserve the nation. They are memorialized in many monuments and semi-sacred days, such as Veterans Day and Memorial Day. This belief system has historically been used to reject nonconformist ideas and groups. Theorists such as Bellah hold that American civil religion can perform the religious functions of integration, legitimation, and prophecy, while other theorists, such as Richard Fenn, disagree. Alexis de Tocqueville believed that Christianity was the source of the basic principles of liberal democracy, and the only religion capable of maintaining liberty in a democratic era. He was keenly aware of the mutual hatred between Christians and liberals in 19th-century France, rooted in the Enlightenment and the French Revolution. In France, Christianity was allied with the Old Regime before 1789 and the reactionary Bourbon Restoration of 1815-30. However he said Christianity was not antagonistic to democracy in the United States, where it was a bulwark against dangerous tendencies toward individualism and materialism, which would lead to atheism and tyranny. Also important were the contributions of French philosopher Jean-Jacques Rousseau (1712–1778) and French sociologist Émile Durkheim (1858-1917). Most students of American civil religion follow the basic Bellah/Durkheimian interpretation. Other sources of this idea include philosopher John Dewey who spoke of "common faith" (1934); sociologist Robin Murphy Williams' American Society: A Sociological Interpretation (1951) which stated there was a "common religion" in America; sociologist Lloyd Warner's analysis of the Memorial Day celebrations in "Yankee City" (1953 ); historian Martin Marty's "religion in general" (1959); theologian Will Herberg who spoke of "the American Way of Life" (1960, 1974); historian Sidney Mead's "religion of the Republic" (1963); and British writer G. K. Chesterton, who said that the United States was "the only nation...founded on a creed" and also coined the phrase "a nation with a soul of a church". In the same period, several distinguished historians such as Yehoshua Arieli, Daniel Boorstin, and Ralph Gabriel "assessed the religious dimension of 'nationalism', the 'American creed', 'cultural religion' and the 'democratic faith'". Premier sociologist Seymour Lipset (1963) referred to "Americanism" and the "American Creed" to characterize a distinct set of values that Americans hold with a quasi-religious fervor. Today, according to social scientist Ronald Wimberley and William Swatos, there seems to be a firm consensus among social scientists that there is a part of Americanism that is especially religious in nature, which may be termed civil religion. But this religious nature is less significant than the "transcendent universal religion of the nation" which late eighteenth century French intellectuals such as Jean-Jacques Rousseau and Alexis de Tocqueville wrote about. Ronald Wimberley (1976) and other researchers collected large surveys and factor analytic studies which gave support to Bellah's argument that civil religion is a distinct cultural phenomenon within American society which is not embodied in American politics or denominational religion. "A president's authority...is from God." Later research sought to determine who is civil religious. In a 1978 study by James Christenson and Ronald Wimberley, the researchers found that a wide cross section of American citizens have civil religious beliefs. In general though, college graduates and political or religious liberals appear to be somewhat less civil religious. Protestants and Catholics have the same level of civil religiosity. Religions that were created in the United States, the Latter Day Saints movement, Adventists, and Pentecostals, have the highest civil religiosity. Jews, Unitarians and those with no religious preference have the lowest civil religion. Even though there is variation in the scores, the "great majority" of Americans are found to share the types of civil religious beliefs which Bellah wrote about. Further research found that civil religion plays a role in people's preferences for political candidates and policy positions. In 1980 Ronald Wimberley found that civil religious beliefs were more important than loyalties to a political party in predicting support for Nixon over McGovern with a sample of Sunday morning church goers who were surveyed near the election date and a general group of residents in the same community. In 1982 James Christenson and Ronald Wimberley found that civil religion was second only to occupation in predicting a person's political policy views. Coleman has argued that civil religion is a widespread theme in history. He says it typically evolves in three phases: undifferentiation, state sponsorship in the period of modernization, differentiation. He supports his argument with comparative historical data from Japan, Imperial Rome, the Soviet Union, Turkey, France and The United States. The American Revolution was the main source of civil religion. It produced a Moses-like leader (George Washington), prophets (Thomas Jefferson, Tom Paine), apostles (John Adams, Benjamin Franklin) and martyrs (Boston Massacre, Nathan Hale), as well as devils (Benedict Arnold), sacred places (Valley Forge), rituals (raising the Liberty Tree), flags (the Betsy Ross flag), sacred holidays (July 4th) and a holy scripture (The Declaration of Independence and the Constitution). Throughout American history, the president has provided the leadership in the public faith. Sometimes he has functioned primarily as a national prophet, as did Abraham Lincoln. Occasionally he has served primarily as the nation's pastor, as did Dwight Eisenhower. At other times he has performed primarily as the high priest of the civil religion, as did Ronald Reagan. In prophetic civil religion, the president assesses the nation's actions in relation to transcendent values and calls upon the people to make sacrifices in times of crisis and to repent of their corporate sins when their behavior falls short of the national ideals. As the national pastor, he provides spiritual inspiration to the people by affirming American core values and urging them to appropriate those values, and by comforting them in their afflictions. In the priestly role, the president makes America itself the ultimate reference point. He leads the citizenry in affirming and celebrating the nation, and reminds them of the national mission, while at the same time glorifying and praising his political flock. Calhoun argues that in the 1880s the speeches of Benjamin Harrison display a rhetorical style that embraced American civic religion; indeed, Harrison was one of the credo's most adept presidential practitioners. Harrison was a leader whose application of Christian ethics to social and economic matters paved the way for the Social Gospel, the Progressive Movement and a national climate of acceptance regarding government action to resolve social problems. Linder argues that President Bill Clinton's sense of civil religion was based on his Baptist background in Arkansas. Commentator William Safire noted of the 1992 presidential campaign that, "Never has the name of God been so frequently invoked, and never has this or any nation been so thoroughly and systematically blessed." Clinton speeches incorporated religious terminology that suggests the role of pastor rather than prophet or priest. With a universalistic outlook, he made no sharp distinction between the domestic and the foreign in presenting his vision of a world community of civil faith. Brocker argues that Europeans have often mischaracterized the politics of President George W. Bush (2001–2009) as directly inspired by Protestant fundamentalism. However, in his speeches Bush mostly actually used civil religious metaphors and images and rarely used language specific to any Christian denomination. His foreign policy, says Bocker, was based on American security interests and not on any fundamentalist teachings. Hammer says that in his 2008 campaign speeches candidate Barack Obama portrays the America nation as a people unified by a shared belief in the American Creed and sanctified by the symbolism of an American civil religion. Would-be presidents likewise contributed to the rhetorical history of civil religion. The speeches of Daniel Webster were often memorized by student debaters, and his 1830 endorsement of "Liberty and Union, now and forever, one and inseparable" was iconic. Before that day, the flag had served mostly as a military ensign or a convenient marking of American territory...and displayed on special occasions like the Fourth of July. But in the weeks after Major Anderson's surprising stand, it became something different. Suddenly the Stars and Stripes flew...from houses, from storefronts, from churches; above the village greens and college quads. ... [T]hat old flag meant something new. The abstraction of the Union cause was transfigured into a physical thing: strips of cloth that millions of people would fight for, and many thousands die for. An important dimension is the role of the soldiers, ready to sacrifice their lives to preserve the nation. They are memorialized in many monuments and semi-sacred days, such as Veterans Day and Memorial Day. Historian Jonathan Ebel argues that the "soldier-savior" is a sort of Messiah, who embodies the synthesis of civil religion, and the Christian ideals of sacrifice and redemption. In Europe, there are numerous cemeteries exclusively for American soldiers who fought in world wars. They have become American sacred spaces. Kao and Copulsky argue the concept of civil religion illuminates the popular constitutional debate over the Pledge of Allegiance. The function of the pledge has aspects: preservationist, pluralist, priestly, and prophetic. 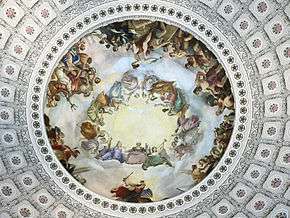 The debate is not between those who believe in God and those who do not, but it is a dispute on the meaning and place of civil religion in America. Cloud explores political oaths since 1787 and traces the tension between a need for national unity and a desire to affirm religious faith. He reviews major Supreme Court decisions involving the Pledge of Allegiance, including the contradictory Minersville School District v. Gobitis (1940) and West Virginia v. Barnette (1943) decisions. He argues that the Pledge was changed in 1954 during the Cold War to encourage school children to reject communism's atheistic philosophy by affirming belief in God. Adam Gamoran (1990) argues that civil religion in public schools can be seen in such daily rituals as the pledge of allegiance; in holiday observances, with activities such as music and art; and in the social studies, history and English curricula. Civil religion in schools plays a dual role: it socializes youth to a common set of understandings, but it also sets off subgroups of Americans whose backgrounds or beliefs prevent them from participating fully in civil religious ceremonies. The Bellah argument deals with mainstream beliefs, but other scholars have looked at minorities outside the mainstream, and typically distrusted or disparaged by the mainstream, which have developed their own version of U.S. civil religion. Wilson, noting the historic centrality of religion in Southern identity, argues that when the White South was outside the national mainstream in the late 19th century, it created its own pervasive common civil religion heavy with mythology, ritual, and organization. Wilson says the "Lost Cause" – that is, defeat in a holy war – has left some southerners to face guilt, doubt, and the triumph of what they perceive as evil: in other words, to form a tragic sense of life. Woodrum and Bell argue that blacks demonstrate less civil religiosity than whites and that different predictors of civil religion operate among blacks and whites. For example, conventional religion positively influences whites' civil religion but negatively influences blacks' civil religion. Woodrum and Bell interpret these results as a product of black American religious ethnogenesis and separatism. Iwamura argues that the pilgrimages made by Japanese Americans to the sites of World War II-era internment camps have formed a Japanese American version of civil religion. Starting in 1969 the Reverend Sentoku Maeda and Reverend Soichi Wakahiro began pilgrimages to Manzanar National Historic Site in California. These pilgrimages included poetry readings, music, cultural events, a roll call of former internees, and a nondenominational ceremony with Protestant and Buddhist ministers and Catholic and Shinto priests. The event is designed to reinforce Japanese American cultural ties and to ensure that such injustices will never occur again. Mexican-American labor leader César Chávez, by virtue of having holidays, stamps, and other commemorations of his actions, has practically become a "saint" in American civil religion, according to León. He was raised in the Catholic tradition and using Catholic rhetoric. His "sacred acts," his political practices couched in Christian teachings, became influential to the burgeoning Chicano movement and strengthened his appeal. By acting on his moral convictions through nonviolent means, Chávez became sanctified in the national consciousness, says León. The National Archives Building in Washington, DC. Christian language, rhetoric, and values helped colonists to perceive their political system as superior to the corrupt British monarchy. Ministers' sermons were instrumental in promoting patriotism and in motivating the colonists to take action against the evils and corruption of the British government. Together with the semi-religious tone sometimes adopted by preachers and such leaders as George Washington, and the notion that God favored the patriot cause, this made the documents of the Founding Fathers suitable as almost-sacred texts. The National Archives Building in Washington preserves and displays the Declaration of Independence, the Constitution and the Bill of Rights. Pauline Maier describes these texts as enshrined in massive, bronze-framed display cases. While political scientists, sociologists, and legal scholars study the Constitution and how it is used in American society, on the other hand, historians are concerned with putting themselves back into a time and place, in context. It would be anachronistic for them to look at the documents of the "Charters of Freedom" and see America’s modern "civic religion" because of "how much Americans have transformed very secular and temporal documents into sacred scriptures". The whole business of erecting a shrine for the worship of the Declaration of Independence strikes some academic critics looking from point of view of the 1776 or 1789 America as "idolatrous, and also curiously at odds with the values of the Revolution." It was suspicious of religious iconographic practices. At the beginning, in 1776, it was not meant to be that at all. On the 1782 Great Seal of the United States, the date of the Declaration of Independence and the words under it signify the beginning of the "new American Era" on earth. Though the inscription, Novus ordo seclorum, does not translate from the Latin as "secular", it also does not refer to a new order of heaven. It is a reference to generations of society in the western hemisphere, the millions of generations to come. Even from the vantage point of a new nation only ten to twenty years after the drafting of the Constitution, the Framers themselves differed in their assessments of its significance. Washington in his Farewell Address pleaded that "the Constitution be sacredly maintained."' He echoed Madison in "The Federalist No. 49", that citizen "veneration" of the Constitution might generate the intellectual stability needed to maintain even the "wisest and freest governments" amidst conflicting loyalties. But there is also a rich tradition of dissent from "Constitution worship". By 1816, Jefferson could write that "some men look at constitutions with sanctimonious reverence and deem them like the ark of the covenant, too sacred to be touched." But he saw imperfections and imagined that potentially, there could be others, believing as he did that "institutions must advance also". Regarding the United States Constitution, the position of The Church of Jesus Christ of Latter-day Saints (LDS Church) is that it is a divinely inspired document. While the civil religion has been widely accepted by practically all denominations, one group has always stood against it. Seventh-Day Adventists deliberately pose as "heretics", so to speak, and refuse to perform in the sacred ceremonies like the Pledge of Allegiance or saluting the flag or treating Sundays as special. Indeed, says Bull, the denomination has defined its identity in contradistinction to precisely those elements of the host culture that have constituted civil religion. The American identity has an ideological connection to these "Charters of Freedom". Samuel P. Huntington discusses common connections for most peoples in nation-states, a national identity as product of common ethnicity, ancestry and experience, common language, culture and religion. The United States has a fate different from "most peoples". American identity is "willed affirmation" of what Huntington refers to as the 'American creed.' The creed is made up of (a) individual rights, (b) majority rule, and (c) a constitutional order of limited government power. American independence from Britain was not based on cultural difference, but on the adoption of principles found in the Declaration. Whittle Johnson in The Yale Review sees a sort of "covenanting community" of freedom under law, which, "transcending the 'natural' bonds of race, religion and class, itself takes on transcendent importance". These political ideals, which emphasize political orthodoxy, make it possible for an ethnic diversity unequaled in Britain, France, Germany or Japan. And, lacking the ancestor who may have landed on Plymouth Rock or a distant cousin "purportedly" related to those of 1776, Anne Norton has explained that it is the only way immigrants can establish a commonality with those who had an ethnic history like those Founding Fathers. That singular commonality has become the criterion for belonging which is almost unusual in its openness to strangers. Becoming a naturalized citizen of the United States requires passing a test covering a basic understanding of the Declaration, the U.S. Constitution, and the Bill of Rights, and taking an oath to support the U.S. Constitution. Hans Kohn described the United States Constitution as "unlike any other: it represents the lifeblood of the American nation, its supreme symbol and manifestation. It is so intimately welded with the national existence itself that the two have become inseparable." Indeed, abolishing the Constitution in Huntington’s view would abolish the United States, it would "destroy the basis of community, eliminating the nation, [effecting] ... a return to nature." Escape clause. Whatever the oversights and evils the modern reader may see in the original Constitution, the Declaration that "all men are created equal"—in their rights—informed the Constitution in such a way that Frederick Douglass in 1860 could label the Constitution, if properly understood, as an antislavery document. He held that "the constitutionality of slavery can be made out only by disregarding the plain and common-sense reading to the Constitution itself. [T]he Constitution will afford slavery no protection when it shall cease to be administered by slaveholders," a reference to the Supreme Court majority at the time. With a change of that majority, there was American precedent for judicial activism in Constitutional interpretation, including the Massachusetts Supreme Court, which had ended slavery there in 1783. Accumulations of Amendments under Article V of the Constitution and judicial review of Congressional and state law have fundamentally altered the relationship between U.S. citizens and their governments. Some scholars refer to the coming of a "second Constitution" with the Thirteenth Amendment, we are all free, the Fourteenth, we are all citizens, the Fifteenth, men vote, and the Nineteenth, women vote. The Fourteenth Amendment has been interpreted so as to require States to respect citizen rights in the same way that the Constitution has required the Federal government to respect them. So much so, that in 1972, the U.S. Representative from Texas, Barbara Jordan, could affirm, "My faith in the Constitution is whole, it is complete, it is total ..."
After discussion of the Article V provision for change in the Constitution as a political stimulus to serious national consensus building, Sanford Levinson performed a thought experiment which was suggested at the bicentennial celebration of the Constitution in Philadelphia. If one were to sign the Constitution today, whatever our reservations might be, knowing what we do now, and transported back in time to its original shortcomings, great and small, "signing the Constitution commits one not to closure but only to a process of becoming, and to taking responsibility for the political vision toward which I, joined I hope, with others, strive." 1 2 Bellah, Robert Neelly (Winter 1967). "Civil Religion in America". Journal of the American Academy of Arts and Sciences. 96 (1): 1–21. Archived from the original on 2005-03-06. From the issue entitled "Religion in America". 1 2 Kaplan, Dana Evan (Aug 15, 2005). The Cambridge Companion to American Judaism. Cambridge University Press. ISBN 0-521-82204-1. p. 118. 1 2 3 4 Cristi, Marcela (2001). From Civil to Political Religion: The Intersection of Culture, Religion and Politics. University Press. ISBN 0-88920-368-7. ↑ Michael A. Genovese (2010). Encyclopedia of the American Presidency. Infobase Publishing. p. 89. ISBN 9781438126388. ↑ Andrew Michael Manis (2002). Southern Civil Religions in Conflict: Civil Rights and the Culture Wars. Mercer University Press. p. 184. ISBN 9780865547858. ↑ George C. Edwards; Desmond S. King (2007). The Polarized Presidency of George W. Bush. Oxford University Press. p. 152. ISBN 9780199217977. ↑ James David Fairbanks, "The Priestly Functions of the Presidency: A Discussion of the Literature on Civil Religion and Its Implications for the Study of Presidential Leadership," Presidential Studies Quarterly (1981) 11:214–32. ↑ Adam Goodheart (2011). 1861: The Civil War Awakening. Vintage Books. p. 22. ISBN 9781400032198. ↑ Jonathan H. Ebel, "Overseas military cemeteries As american sacred space: mine eyes have seen la gloire." Material Religion 8#2 (2012): 183-214. ↑ Kelly Denton-Borhaug, "Sharing Peace: Mennonites and Catholics in Conversation eds. by Gerald W. Schlabach and Margaret Pfeil," American Catholic Studies 125#2 (2014): 82-83. ↑ Kelly Denton-Borhaug, U.S. War-Culture, Sacrifice and Salvation (2011) p 1-4. ↑ Michael W. Casey, "From Pacifism to Patriotism: The Emergence of Civil Religion in the Churches of Christ During World War I." Mennonite Quarterly Review 66.3 (1992): 376-390. ↑ Great Seal webpage. Viewed August 19, 2011. ↑ Levinson 1987, p. 115. ↑ Dallin H. Oaks (Feb 1992). "The Divinely Inspired Constitution". Ensign. ↑ Levinson 1987, p. 118. 1 2 Levinson 1987, p. 119. ↑ Levinson 1987, p. 120. 1 2 Harper, Douglas (January 2004). "Emancipation in Massachusetts". Slavery in the North. Archived from the original on January 28, 2004. Retrieved January 28, 2004. 1 2 Levinson 1987, pp. 129-130, 133. ↑ The visitor to the National Archives website today is invited to sign the Constitution online. Viewed September 11, 2011. ↑ Levinson 1987, p. 144. Bellah, Robert Neelly (Winter 1967). "Civil Religion in America". Journal of the American Academy of Arts and Sciences. 96 (1): 1–21. Archived from the original on 2005-03-06. From the issue entitled Religion in America. Bellah, Robert Neelly (August 15, 1992). The Broken Covenant: American Civil Religion in Time of Trial. University of Chicago Press. ISBN 0-226-04199-9. Bortolini, Matteo (2012). "The trap of intellectual success. Robert N. Bellah, the American civil religion debate, and the sociology of knowledge". Theory & Society. 41 (2): 187–210. doi:10.1007/s11186-012-9166-8. Canipe, Lee (March 2003). "Under God and anti-communist: how the Pledge of Allegiance got religion in Cold-War America". Journal of Church and State. Cloud, Matthew W (March 22, 2004). ""One nation, under God": tolerable acknowledgement of religion or unconstitutional cold war propaganda cloaked in American civil religion?". Journal of Church and State. 46 (2): 311. doi:10.1093/jcs/46.2.311. Gehrig, Gail (June 1981). American Civil Religion: An Assessment. Society for Scientific Study. ISBN 0-932566-02-2. Gardella, Peter, American Civil Religion: What Americans Hold Sacred (Oxford University Press, 2014), 368 pp. Hughes, Richard T. (July 6, 2004). Myths America Lives By. University of Illinois Press. ISBN 0-252-07220-0. Jewett, Robert; John Shelton Lawrence (2004). Captain America and the Crusade Against Evil: The Dilemma of Zealous Nationalism. Wm. B. Eerdmans Publishing. ISBN 0-8028-2859-0. Page 328 specifically talks about American civil religion, referencing Jones's book, American Civil Religion. Jones, Donald G.; Russell E. Richey (November 1990) [1st pub. 1974 by Harper]. American Civil Religion. HarMellen University Press. ISBN 0-7734-9997-0. Levinson, Sanford (1979). ""The Constitution" in American Civil Religion". The Supreme Court Review. 1979: 123–151. JSTOR 3109568. Pierard, Richard V. and Robert D. Linder, "The President and Civil Religion," in Encyclopedia of the American Presidency ed. by Leonard W. Levy and Louis Fisher, (1994), I: 203-06. Rouner, Leroy S. ed. Civil Religion and Political Theology (1986). SpearIt (2013). "Legal Punishment as Civil Ritual".